London Visit: Pop down to Pop Brixton and explore this fantastic shipping container community while the weather is still good. If you haven’t heard about this project, it’s a buzzy space for locals to get their budding business off the grown. You’ll find plenty of street food to feast on, drinks to sample and boutiques to browse, all housed in shipping containers. Commissioned by Lambeth Council and designed by Carl Turner Architects in partnership with The Collective, it’s got a feel good vibe going on. 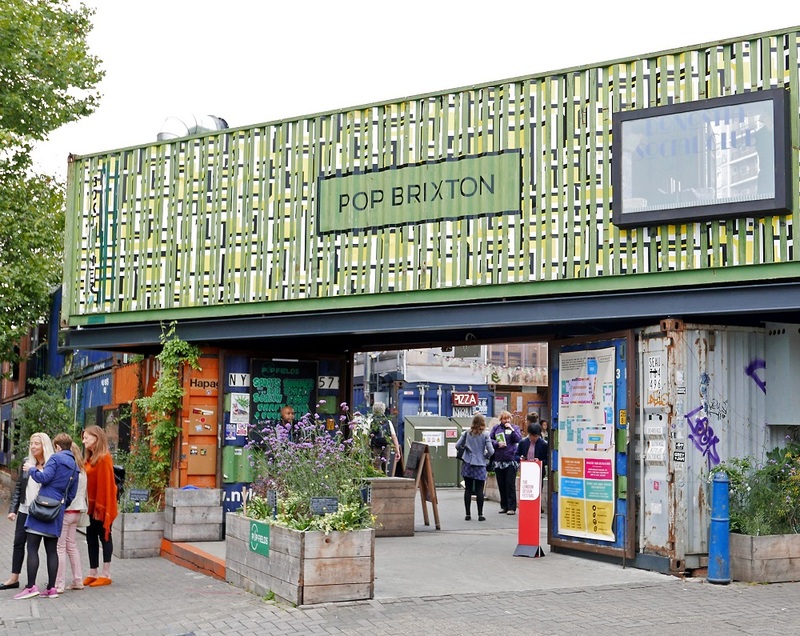 If you’re looking for places to eat in Brixton or things to do in London at the weekend, visit Pop Brixton to eat, drink and explore. This is a great place to head to at the weekend if you want to sample some amazing food. Located inside shipping containers you’ll find a number of businesses serving up delicious street feast delights. I’ll mention some of those to give you a flavour of what to expect. For Italian food try Franzina Trattoria, share tapas at Donosita Social Club, slurp up some Japanese noodles at Koi Ramen, enjoy the taste of Vietnam at Viet Box or munch a Baba G’s Bhangra Burger. I visited with my friend Alan and we sampled the tacos at Maria Sabina. Alan opted for the Chicken Tinga which is shredded chicken with onions which is simmered in thick chipotle sauce. I tried the veggie option which was an interesting hibiscus flower with potatoes. You get three tacos for £5 or five for £7. Once you’ve bought your food there are plenty of places to sit down and enjoy your meal. On a nice day you can perch on the benches and if you need shelter just head upstairs to the Collective Greenhouse. Don’t forget to order some drinks at the Brixton Port Authority or one of the other bars. What’s great about this place is that it’s more than just food. There are plenty of other businesses located here. You can browse boutique stores to buy clothing, fashion accessories and jewellery. Treat yourself to a customised portable speaker at BoomBocs. Flick through some vinyl at Container Records or Get your hair cut at London Barberhood. With a number of startup businesses located here, it’s a creative hub for Brixton. I loved the Pop Farm which is an urban growing project aimed at making gardening more accessible for locals. You’ll notice containers dotted around and a green house where you’ll see decorative plants, fresh herbs and fresh vegetables sprouting. With educational workshops and classes for schools and the community, it’s a brilliant way to get people interested in horticulture. At the back of Pop Brixton you’ll find Pop Fields. Here you will find an artificial playing field for sport with seating. There’s also a big screen for viewing events. With refreshment bars and catering, it’s a great place to hire for a private party. Keep an eye out for forthcoming events. Pop Box is a large covered space which often houses events and activities which include fitness classes, tai chi and yoga. You can also hire this area for your own private event. To find out more visit the Pop Brixton Website. The address is 49 Brixton Station Road, London SW9 8PQ. Opening hours are; Monday, Tuesday, Wednesday and Sunday 9am-11pm. Thursday, Friday and Saturday 9am-midnight. It’s easy to get there, travel to Brixton tube station on the Victoria line or the Southeastern run train station. It’s just a short walk the tube or train station. Make sure you visit soon! Author: Homegirl London. Photographs: Homegirl London. Thanks: Alan and Homeboy for visiting with me.